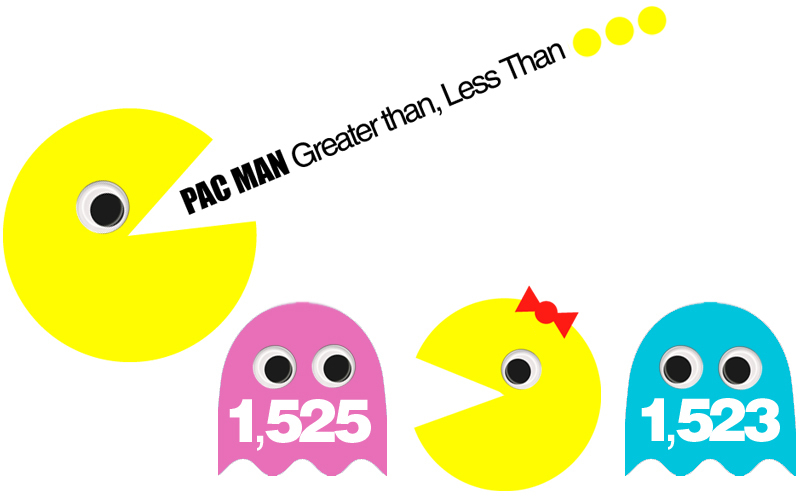 Awesome idea from The Feisty Classroom: Pac Man, Greater Than, Less Than! To turn this idea into a math station, I decided to make paper cutouts of Pac Man, Ms. Pac Man, and the ghosts. Cut the shapes out of construction paper and add googly eyes. Don't forget to give Ms. Pac Man a bow! Put numbers on your ghost and have kids compare! Pac Man prefers greater numbers. They're more filling! To turn this into a 2 player game, you will only need one Pac Man. Lay all the ghosts face down (no cheating!). Each player pulls a ghost from the pile and lays it down. Whoever has the greatest number gets a point. - or - You could do who ever has the smallest number gets a point, because their ghost avoided getting eaten! You Choose! The player with the most points wins! For more of a challenge, each time a player wins, he writes down the number on the ghost. At the end of the game both players add up all of their numbers. Then, they compare their sum. Whoever has the greatest sum wins! Your blog has been amazing...so glad I found it! I was looking for water cycle stuff and then stayed here looking at all the other wonderful ideas you have. Thank you so much for sharing! Thanks! I can't wait till I start teaching, and can try out everything I post! I'm your newest follower!